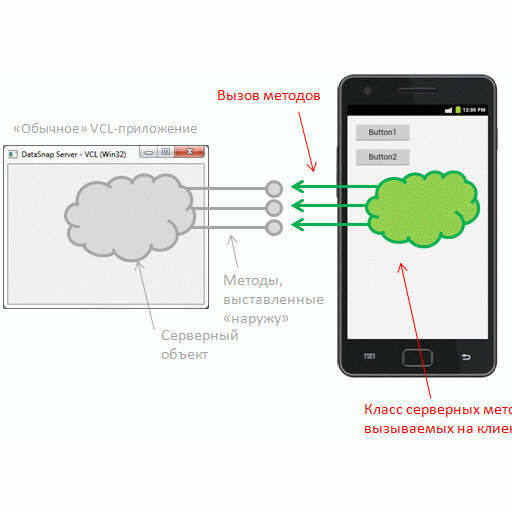 Vsevolod Leonov from Embarcadero has a blog post up about a DataSnap Android Client demo. DataSnap is the name of the components within Delphi XE5 Firemonkey that facilitate easy client/server communication between client and server Delphi applications. There is another tutorial on building a DataSnap server both stand alone and with ISAPI here. The server side of DataSnap is built using Delphi VCL. Vsevolod’s blog post concentrates on the Android client side end of DataSnap. It uses TCP/IP for it’s transport protocol but HTTP could also be used. The demo is simple enough with just two buttons that send data to the server from the client. The client is built for Android but should also work on IOS and Windows as well. The post is in Russian but I have run the link through Google Translate for you. Head over and read the full blog post about building a DataSnap client server.